While I lived in New York, my friends and I had a tradition of heading out for a tasting day in Long Island at least once a year while the weather was nice. It was always a lovely day trip. 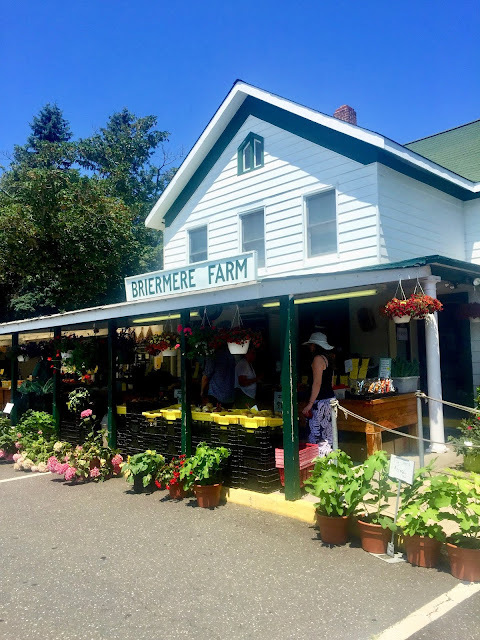 Stops at Briermere Farms (anytime) and/or at one of the many orchards in the area for apple picking (in the fall), are favorite detours on a Long Island wine tasting day. Long Island wine tasting always made a wonderful and much needed escape from the city. However, I’ve gotta admit that I have mixed feelings about the wine, as I’ve found the quality to be inconsistent. I think there are a number of factors contributing to this. First of all, it’s a younger wine region. The first vineyards were planted in 1973, which means they’ve just had less time to work out the kinks. They’re likely to have more weather curveballs coming their way, which means there's going to be more vintage variation. The climate has been compared to Bordeaux’s as it’s maritime and on a similar latitude, and it has a lot of the same problems. Beyond these understandable hurdles, more than one winery I’ve visited has struck me as a vanity project where someone wanted a pretty vineyard and tasting room to show off, but didn’t really have the know-how to deliver the quality. (Admittedly, these types of places exist everywhere.) They also have a somewhat captive audience for part of the year via Hamptons vacationers that will buy their wines, even if they’re being upcharged (or so it seems to me). 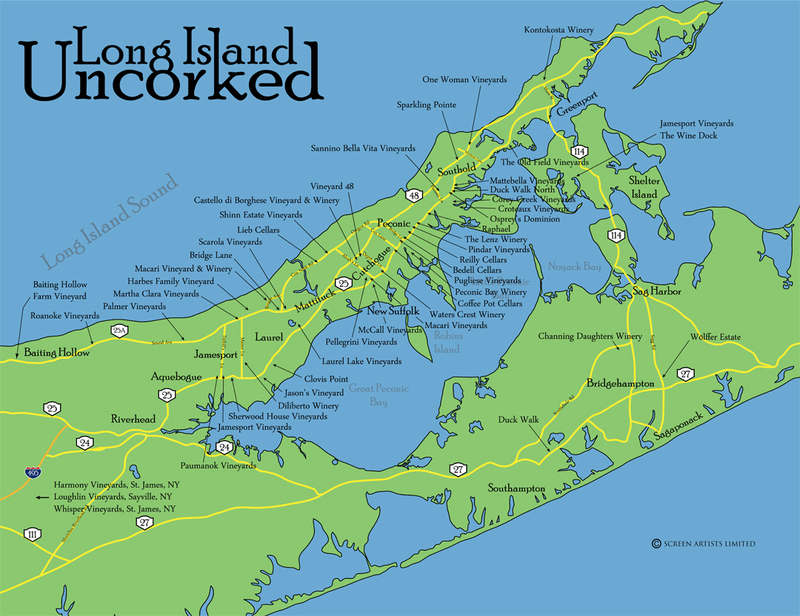 Map borrowed from Long Island Uncorked. I’m sure I’ve now succeeded in making you completely unenthusiastic about this region. HOWEVER, it seems to me that quality in the region is on an upward swing overall. It does have a lot going for it. The upside of the region’s proximity to the Atlantic is that the ocean helps to moderate temperatures. The area also sees a good amount of sunshine to help grapes ripen. The area's sandy soils, with deposits of clay and gravel, are nicely free-draining which puts a check on the vigor of the vines, contributing potential for quality grapes. They’ve been figuring out what works–Merlot, Cab Franc, Chardonnay, and Sauvignon Blanc are generally recognized as showing a lot of promise. A really awesome aspect to the region is that small, family-run operations tend to be the norm, and there’s a solid handful of truly quality conscious producers. Searching out the cream of the crop is definitely worthwhile. Macari Vineyards is one of those spots for me. It’s a full-on family affair. 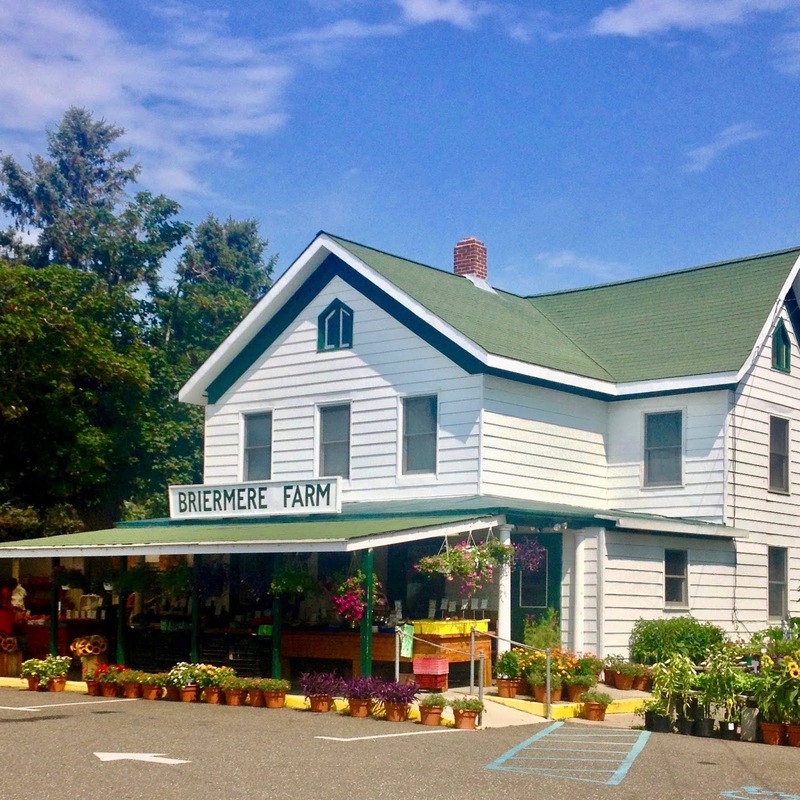 Joseph and Alexandra Macari moved to the North Fork of Long Island in 1995 with their four children to begin planting vines. 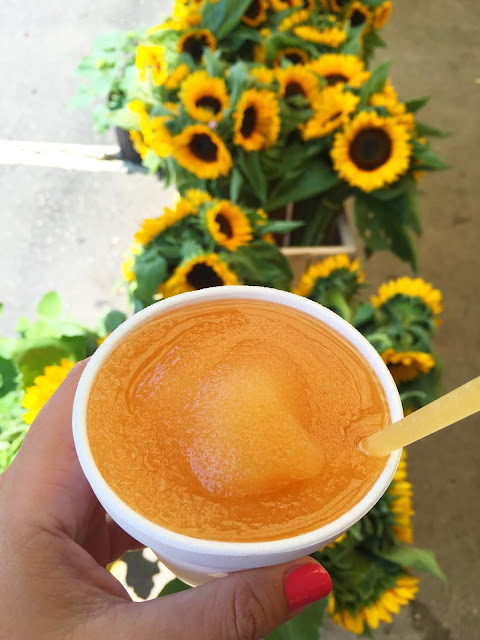 Joseph’s father, Joseph Sr., had purchased the then 500-acre former potato farm in the mid 60’s. Joseph Jr. went on to study biodynamic viticulture and takes a ecological and holistic approach to viticulture. Meanwhile, Alexandra Macari has been the Managing Director of Macari Vineyards for over twenty years. 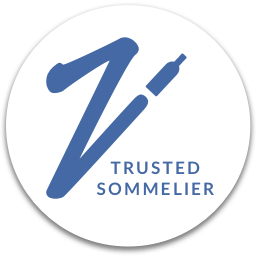 Their son Joseph worked extensively alongside his father in the vineyards and has been Vineyard Manager since 2011. Gabriella Macari currently manages education, distribution, marketing, and assists in the cellar and in the vineyard. Macari’s winemaker Kelly Koch brings a little extra lady-power to the operation. I crossed paths with Gabriella a bit in NY while we were each working on our WSET Diplomas. She always struck me as one cool gal. She’s going on to tackle the Master of Wine and I’m sure she will be awesome. 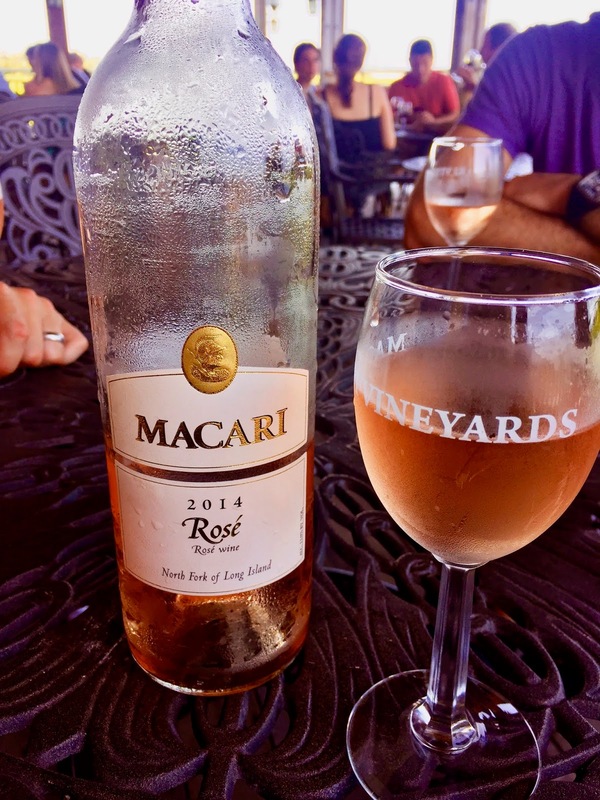 Macari's rosé is lovely on a summer day. Gabriella graciously arranged for a tasting for me and my friends during our yearly group outing during our last summer in New York. It proved to be a resounding favorite. 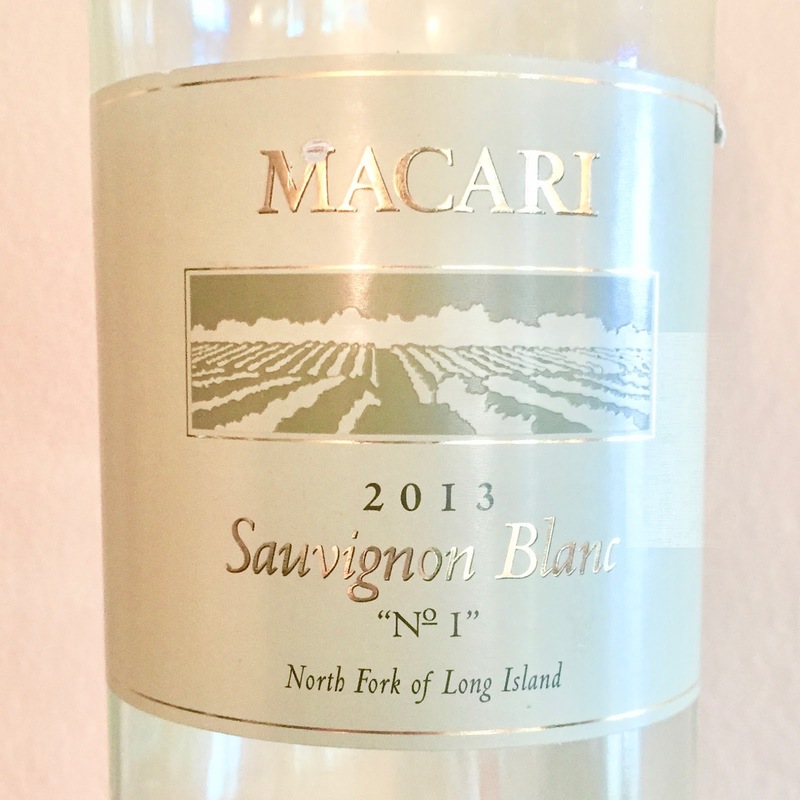 On that visit, I took home a bottle of their Macari Vineyards No.1 Sauvignon Blanc North Fork of Long Island 2013, which was fermented and aged in concrete eggs. (I believe this now goes under the name Lifeforce, $28.) Their super crisp and refreshing, stainless steel Sauv Blanc was the group favorite, but I was intrigued by the added textural elements the concrete brought to the variety. More than that, I took home this bottling because I got a clear image right then of exactly what I wanted to have with this wine–a springy risotto. On the day we opened this wine, Greg and I picked up notes of white peach and melon alongside more typical Sauvignon Blanc notes of lemon and lime, including a bit of candied lemon zest and lemon cream, and fresh, sweet snap peas on the nose. There was also a touch of hay and cheese rind. 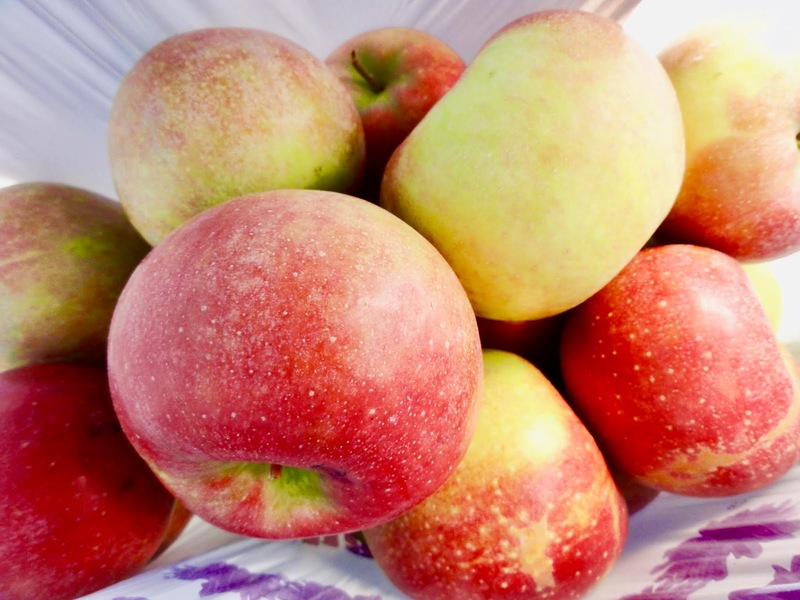 On the palate, it was savory and bright with the notes of citrus, white peaches, green herbs, and hay continuing on in the flavor profile. There was a touch of honeysuckle to add a light floral element. There was a steely, stony minerality at the core, fleshed out by added texture that rounded out the body. The idea of a risotto continued to resonate, so we went on with that plan. I decided to make a lemony pea risotto–a pretty classic combo–and I knew I wanted to add a strong herbal component, but was undecided as to which way I wanted to go. I was curious what herb would best work with this specific wine, so we decided to conduct an experiment. Greg and I went through and tasted a line up of different herbs alongside the wine to see what worked. Our two favorites were mint and sage. Mint was refreshing and seemed perfect for warm weather, so that's what we chose for this dish. Sage brought out the earthy side of the wine and I think it would be ideal for fall. The runners up were basil and oregano, similarly taking the dish in spring/summer and autumnal directions respectively. The nice thing is that since the ingredients for this dish are available year-round (taking into account frozen peas), you can easily adjust the dish to your seasonal tastes. I thought the creamy, silky texture of scallop would be the perfect thing to top off the risotto and complement the wine. They did just that! The whole thing worked beautifully and complemented the wine just as well as I’d hoped. Creamy, fresh, and decadent! As mentioned, this specific cuvée is no longer available. See Macari's website for info on the Lifeforce, which seems to be the new name for this wine. I think the extra texture on this wine would allow it to pair nicely with weightier foods than one might typically think of for Sauv Blanc. For other options, look for medium weight white wines with fresh acidity, rounded mouthfeel, lots of citrus, and herbal notes. Tips: Leftover cheese rinds are a great way to boost the flavor of risottos and soups. I you have a few hanging around, add them along with stock, then just remove them before serving. If you’d like a little more instruction, The Kitchn has good article on making successful risotto. See here for more tips. 4 to 6 large servings. 1. Warm stock in a saucepan. 2. In a large sauté pan with high sides, sweat onions in a small amount of oil over medium heat with a pinch of salt. Once the onions are translucent and soft, add the butter and melt. 3. Add the arborio rice and stir in the onion mixture, coating well with the oil/butter. Allow the rice to cook in the fat for a couple of minutes until it smells lightly toasted, then deglaze the pan with the wine. Season with salt. 4. Once the wine has evaporated, ladle in enough stock to just cover the rice and stir. Allow the stock to stock to absorb before adding more, stirring occasionally. Repeat this step until the risotto is al dente and has a creamy texture. (If you use up all the stock, you may use water as well.) When the risotto is just nearly at the texture you like, stir in the peas, ricotta, and lemon juice and cook for another couple of minutes. Add lemon zest and salt to taste. Keep the risotto warm until ready to serve. Tip: If you're making risotto for guests, you can prepare it before they arrive and hold it at al dente until you're ready to serve. Just rewarm, add a little more stock or water, and finish cooking as you're prepping the scallops. 5. Chop mint leaves just before you’re ready to prepare the scallops. Stir the mint and the Parmesan cheese into the risotto, reserving a small amount of each for garnish. If risotto has thickened too much, you can add a small amount of warm stock or water to loosen slightly until desired creaminess is reached. 6. Heat a generous amount of oil in a large pan. (You can also add a little butter to the pan if desired.) Season scallops with salt and pepper. Once the oil is very hot, carefully add the scallops to the pan. Cook the scallops for a couple of minutes per side, or until they have developed a golden brown crust and are no longer translucent. Remove from heat and season lightly again with salt and pepper to taste. 7. Serve risotto with 4 to 5 scallops per portion and garnish with a sprinkling of mint and Parmesan. All Scallop & Risotto picture photo credit to Greg Hudson. I'll take all the lady power at Macari as an opportunity to shamelessly plug the latest project I'm involved in again: Bâtonnage, a day-long forum opening up a conversation about women in wine taking place on 7/28/18. Tickets for the event are actually already sold out, but there are many ways to support the event including buying t-shirts and swag. You can also follow us on social media and we will be finding additional ways to bring the discussions to you if you can't make it. Stay tuned! Jade from Tasting Pour is sharing "Cauliflower Rice Risotto and Brandborg Gewurztraminer". Cam of Culinary Adventures with Camilla has "A Few Firsts with the Infinite Monkey Theorem: From Colorado + From a Can". 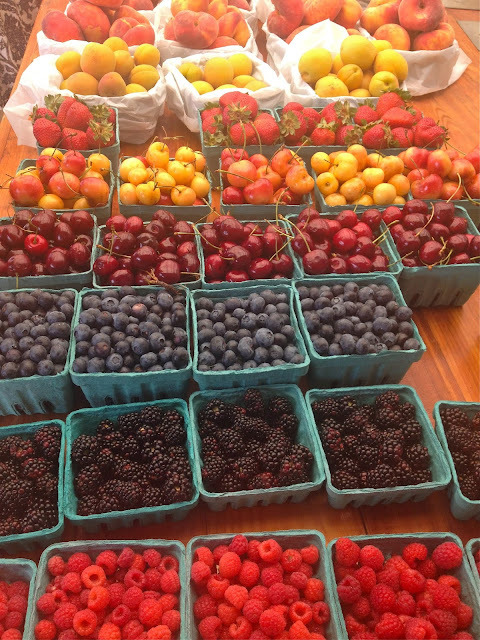 Lori of Dracaena Wine talks about how "Bi-coastal Life Gets Confusing.. Thank Goodness for Wine". David over at Cooking Chat shares "Slow Cooker Honey Mustard Chicken Thighs with Wine Pairings"
Jill of L'Occasion is talking about "Midwestern Gardens and Missouri Wine: America's First AVA". Gwendolyn of Wine Predator invites us to "Under the Radar Regions: Ventura County says Ghost Wineries Be Gone!" Jane from Always Ravenous says "Georgia Frogtown Wines with Pimiento Cheese Peach Toast"
Cindy of Grape Experiences suggests we "Go Greek! Cinnamon Lamb Stew and Limniona/Xinomavro from Karditsa". Wendy at A Day in the Life on the Farm is "Chilling out with Green Barn Winery"
That is a lovely dish and I'm glad you found a wine to pair. I did visit the finger Lakes region of NY for a mystery wine tour. We had a lot of fun. To be honest, I'm a bigger fan of the Finger Lakes as a whole. Some great stuff up there and prices are often reasonable too! 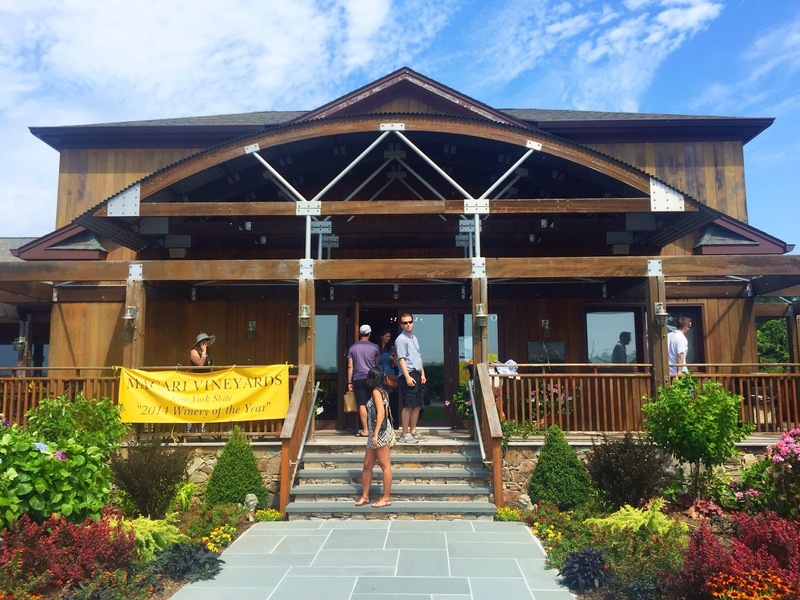 Long Island wineries definitely are a great day trip if you are in NYC! I've had a chance to visit a few; really like Shinn Estate. Haven't heard of Macari, will keep my eyes out for it. And love this recipe -- sharing! Shinn is definitely in my top 5 in Long Island as well. Also wonderful wines!